This month, was hosted by The Center for Maximum Potential, sustainability stalwarts soon celebrating their 35th anniversary! CMPBS, established in 1975, is a non-profit education, research, and demonstration organization specializing in life cycle planning and design. Co-Directors Pliny Fisk and Gail Vittori talked with us about the 35 year history of CMPBS and staff were available to answer questions about the site. 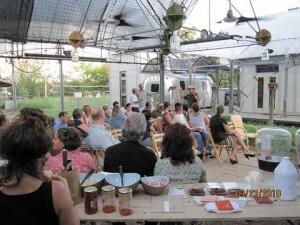 We enjoyed food and beverages from SESA Teas, El Milagro, Theo Chocolate and more!